We Build It Ltd design and manufacture a range of sewerage treatment plans. 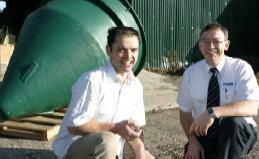 They specialise in creating biopure septic tanks that are odourless and reduce pollution. The company were looking to start exporting the products in order to increase their customer base. To do this We Build It needed to CE mark their wastewater treatment systems under the Construction Products Directive, in effect a ‘passport’ to market and trade their products within the European Economic Area. Unsure of where to start to meet this standard, We Build It contacted MAS-WM and CE Marking Association. Specialist Manufacturing Advisor Peter Roach and consultants the CE Marking Association conducted a review of operations to discover how to achieve the CE Mark for their products. The process required various assessments to take place, ensuring the company adhered to European standards. A technical file was compiled showcasing the work completed at various stages of the project as evidence for the accreditation. Dave Thompson, Managing Director of We Build It. The teams’ initial assessment results showed that improvements needed to take place for the product to achieve accreditation. This included providing additional information on labels and in their user manual and detailing factory production control procedures for quality management. The tests included a water tightness test, treatment efficiency test and structural test. These would all take 38 weeks to complete and had to be tested by a European notified body. Once a suitable notified body was sourced the team began the process by attending a 2 day workshop on CE Marking to equip them with the knowledge to understand the process taking place. As a result of the project We Build It have increased turnover by 40%. They are now selling between 6-7 tanks a week as opposed to 2-3 prior to the project. We Build It have also seen an increase in value added to the company by £40,000 and are even considering moving to larger premises to cope with the increasing demand. 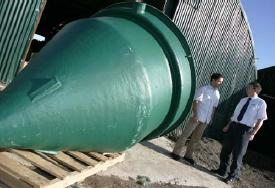 We Build It now have the capability to export their septic tanks and in the future plan to exploit the French market where there is currently a high demand.